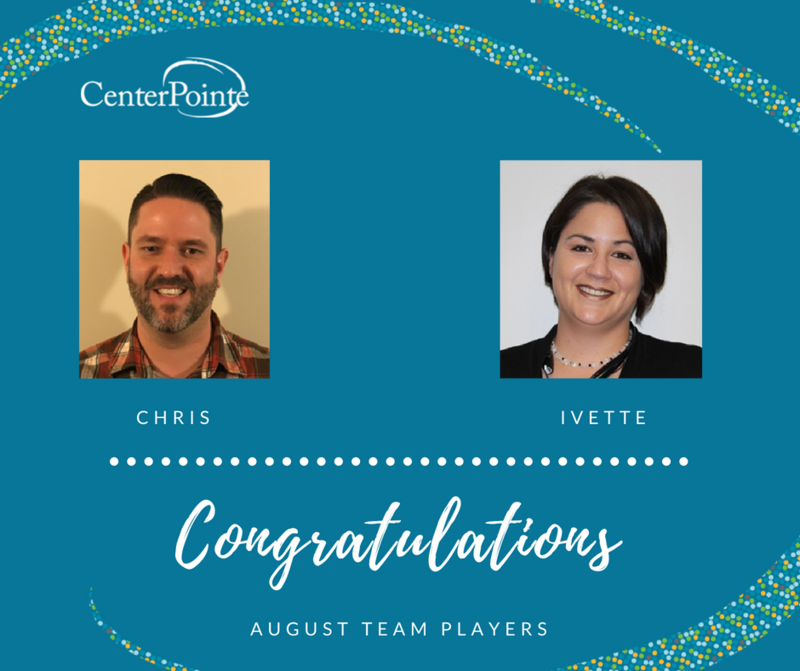 Congratulations to Chris and Ivette for being recognized as Team Players of the Month! This month’s Team Player’s presence always brings so much positivity to the whole office. He says hi to anyone and everyone. I almost never see him in a bad mood even on some of the toughest days we have. He always has something positive to say and is always smiling. He is selfless and anyone can see he cares deeply about his clients and everyone around him. He is always so excited and upbeat about working. I don’t know what I would do without my buddy. He approaches situations with thought as well as relying on his instincts (which have proven to be in line with CenterPointe’s values of doing the right thing, accepting everyone for who they are, helping and empowering people to help themselves, fostering an environment for growth, and to be the best.) He will volunteer and take on tasks/projects/opportunities in order to assist those we serve. Every. Day. His attitude is AMAZING and he brings a high level of professionalism and integrity to and through the work he performs. Congratulations Chris for being recognized as team player of the month! This employee is one of the hardest working individuals at CenterPointe. She is always taking on extra work, juggling multiple tasks, and answering hundreds of questions for everyone. And yet, she still goes out of her way on a regular basis to offer to help her coworkers and she does it all while being positive and a joy to work with. She is organized, reliable, efficient, and she excels at making every client, visitor, and employee feel welcome at Campus for Hope. She has made several incredible changes to improve the efficiency of processes at the front and continues to provide innovative suggestions to make Campus for Hope a welcoming and enjoyable place to be. Ivette is a rock star and definitely deserves to be recognized as Team Player of the Month!